The live inventory system should help make it "as easy to shop locally as it is online" said Google. Mr Kreijn literally had a "lightbulb moment" when one of the bulbs in his flat went, and he searched online to buy a replacement. "That's how he pitched the business to me," Mr Brackenbury told the BBC. "It seemed crazy that it was easier to get a lightbulb shipped from a warehouse than from a shop 100 metres from his house. "We all live our lives through our smartphones but they are blind to what is on the shelves of shops we are walking past. If that is made clear to people, then I am very optimistic about the future of the High Street," he told the BBC. The pair developed technology which connects to a retailer's point of sale system, extracting the data and showing - in real time - what they stock and at what price. "We are champions of the High Street as a whole but the small shops are the businesses that are able to make the fastest decisions," said Mr Brackenbury. Nathalie Walton, global head of local shopping at Google, said of the partnership: "It gives small retailers the ability to compete effectively in the online world, without needing any of the technical and financial firepower of their online competitors." Nick Carroll, a senior retail analyst at research firm Mintel said: "We can't pretend that there are not problems on the High Street and we have seen a number of large chain closures in the last 18 months, but eight out of every 10 pounds is still spent offline. 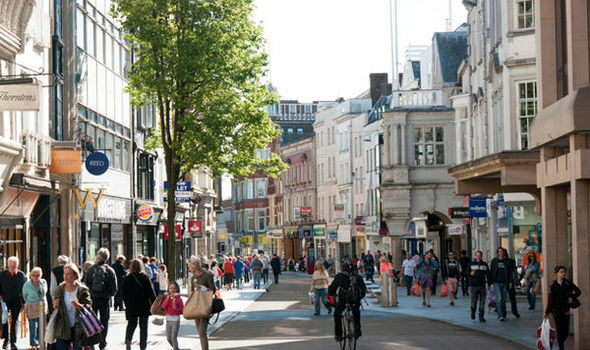 "It has been easier for major retailers to integrate technology, so partnerships like this are important to support local independent stores, which make the High Street unique and provide its backbone. Using this type of tech, they can fight back."